Neven won the die roll and chose to play second, much to Nadaban’s surprise. He may not have been aware that Neven was using a Lunalight strategy focused on the Battle Phase. Nadaban began with Sekka’s Light. He revealed Danger! Mothman! in his hand, and discarded Darkest Diabolos, Lord of the Lair. He Special Summoned Mothman and drew a card. He followed that with Phantom Skyblaster, creating two Skyblaster Tokens. He used a Token to play Link Spider. He used Danger!? Tsuchinoko? in his hand, discarding Danger!? Jackalope?. He Special Summoned Tsuchinoko, and Jackalope Special Summoned Danger! Nessie!. 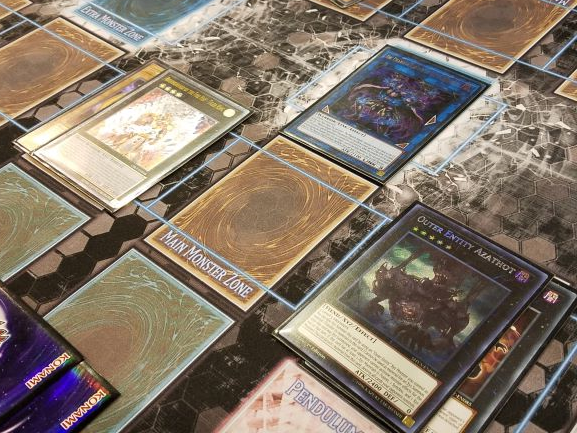 He used Nessie, Mothman, Link Spider, and the remaining Token to play Saryuja Skull Dread, drawing four cards and returning three to his Deck. He had Saryuja use its effect to Special Summon Thunder Dragondark. He banished Mothman to Special Summon White Dragon Wyverburster, and used it to play Guardragon Elpy. Wyverbuster searched out Black Dragon Collapserpent, and he used Elpy to bring Eclipse Wyvern to the field. 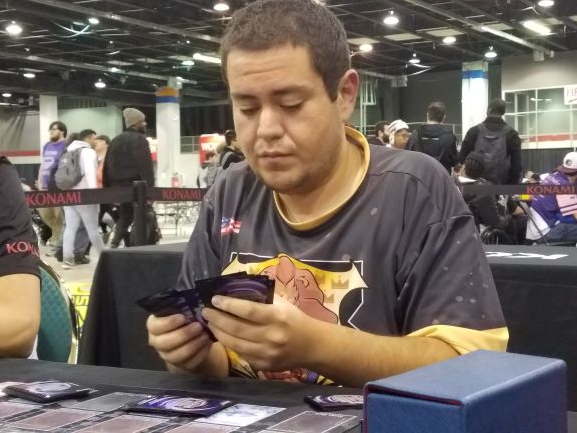 He used Eclipse and Saryuja to play Guardragon Agarpain, and Eclipse banished Chaos Dragon Levianeer from the Deck. He used Agarpain to Special Summon Hot Red Dragon Archfiend Abyss! He used Elpy, Agarpain, Dragondark, and Skyblaster to play a new Saryuja. Dragondark’s effect put Thunder Dragonroar in his hand, and Saryuja once more let him draw four cards and put three back. He banished Eclipse Wyvern to Special Summon Collapserpent, and that let him add Levianeer to his hand. He used Dragonroar from his hand, adding Dragondark to his hand. He Special Summoned Dragondark with Saryuja, then Tributed it to play Thunder Dragon Colossus and Special Summoned Diabolos from his Graveyard. He used Diabolos, Tributing Tsuchinoko to put Dinowrestler Pankratops from Neven’s hand on top of his Deck. Nadaban used Sekka’s Light in the Graveyard, shuffling a Levianeer back into his Deck to draw a card. He used Thunder Dragon’s effect to get two more copies of Thunder Dragon. He then banished Tsuchinoko and his two Guardragons to Special Summon Levianeer! It shuffled Radian, the Multidimensional Kaiju from Neven’s hand into the Deck. Nadaban used Diabolos and Levianeer to Xyz Summon Number 22: Zombiestein! He then used Saryuja and Collapserpent to play Reprodocus, and Collapserpent searched for Wyverbuster. He used Tsuchinoko from his hand, discarding Wyverbuster, and Special Summoned the Tsuchinoko. He had Reprodocus turn Tsuchinoko into a Dinosaur, and used both to play Summon Sorceress. It was pointing to Thunder Dragon Colossus, and Special Summoned Thunder Dragonhawk from the Deck. He Tributed Dragonhawk to play another Colossus! Dragonhawk let him shuffle four cards from his hand into the Deck and draw new ones in their place. He passed with no other plays. Neven started his first turn with just three cards: Danger! Mothman!, Lunalight Serenade Dance, and Danger!? Tsuchinoko?. He drew another Mothman and activated it. He discarded Serenade Dance and Special Summoned the Mothman, drawing The Phantom Knights of Silent Boots. He activated his second Mothman, discarding Silent Boots. He Special Summoned Mothman and drew Danger! Bigfoot!. He used both Mothmen to play Outer Entity Nyarla, then that to play Outer Entity Azathot! Thanks to Azathot he was safe from Nadaban’s activated monster effects this turn. He activated Bigfoot, and discarded Tsuchinoko. He Special Summoned Bigfoot and Tsuchinoko, and drew The Phantom Knights’ Rank-Up-Magic Launch. Neven banished Serenade Dance from the Graveyard, sending his Rank-Up-Magic to the Graveyard and Special Summoning Lunalight Kaleido Chick. He used Kaleido Chick’s effect to send Lunalight Yellow Marten to the Graveyard. He used Yellow Marten’s effect, bouncing Kaleido Chick to his hand, and he Normal Summoned the Chick and used its effect again, this time sending Lunalight Panther Dancer to the Graveyard. He used the Lunalights to play Brotherhood of the Fire Fist – Tiger King, which Set Fire Formation – Tenki. Tiger King detached Yellow Marten to negate Nadaban’s Continuous Effects! Now free from Thunder Dragon Colossus, Neven flipped Tenki to get Lunalight Black Sheep. He used Azathot, Bigfoot, and Tsuchinoko to play Curious, the Lightsworn Dominion! It sent Lunalight Wolf to the Graveyard, then sent a Yellow Marten and two Foolish Burial Goods to the Graveyard. He used Tiger King and Curious to play Underclock Taker. He played Wolf in his Pendulum Zone, using its effect to banish Lunaligts from the Graveyard and Fusion Summon Lunalight Leo Dancer! Underclock dropped Nadaban’s Summon Sorceress to 0 ATK, and Leo Dancer wiped it out! With its effect, Leo Dancer then destroyed all Nadaban’s monsters! Leo Dancer attacked directly with its second attack, and Underclock Taker finished the Duel! Nadaban chose to play second. Neven began with a hand of Luna Light Perfume, Lunalight Tiger, Lunalight Yellow Marten, Dinowrestler Pankratops, and Lunalight Kaleido Chick. He Normal Summoned Kaleido Chick, which sent Lunalight Emerald Bird to the Graveyard. He activated Perfume to Special Summon Emerald Bird, discarding Yellow Marten to draw Mothman. Neven Link Summoned Underclock Taker, and Nadaban had Fantastical Dragon Phantazmay, and Chained Thunder Dragondark’s effect to get another Dragondark first. Neven continued after the Chain resolved, playing Tiger in his Pendulum Zone and using it to Special Summon Kaleido Chick. He used the Chick to send Lunalight Panther Dancer to the Graveyard. He then bounced Tiger to Special Summon Yellow Marten from the Graveyard. 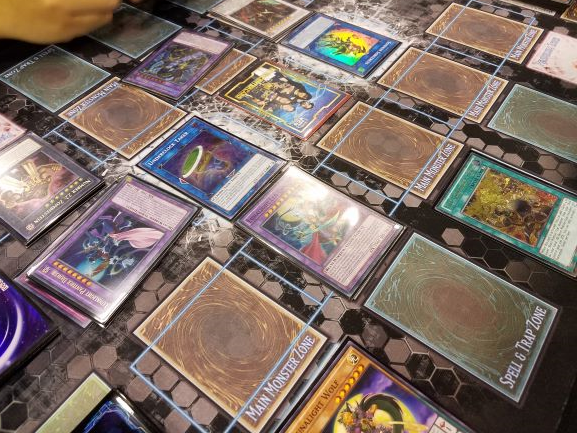 He used Kaleido Chick and Underclock Taker to play The Phantom Knights of Rusty Bardiche. Its effect sent Silent Boots to the Graveyard to Set The Phantom Knights’ Rank-Up-Magic Launch on the field. He then banished Silent Boots to get The Phantom Knights of Shade Brigandine, and Set it. Once again he played Tiger in his Pendulum Zone, and it Special Summoned Kaleido Chick. He used the Chick to send Lunalight Purple Butterfly to the Graveyard. He used Chick and Marten to play Brotherhood of the Fire Fist – Tiger King, which Set Fire Formation – Tenki. He used that to add another Yellow Marten to his hand. He used Tiger King’s effect, detaching Yellow Marten, then flipped Shade Brigandine. He used Purple Butterfly in the Graveyard to Special Summon Yellow Marten from his hand, using the trap and monster to play Time Thief Redoer! 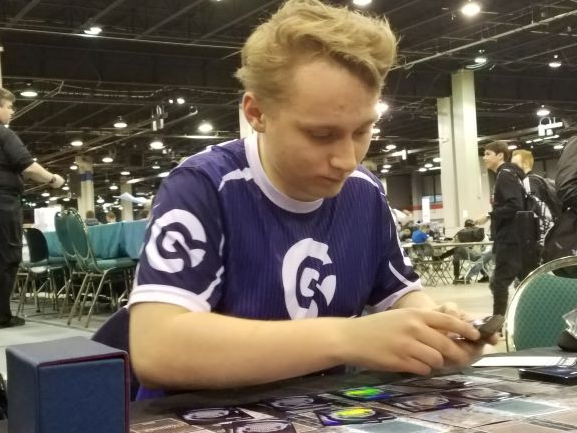 He used Redoer’s effect, detaching both Xyz Materials – he banished Redoer until the End Phase, and put Fantastical Dragon Phantazmay on top of Nadaban’s Deck. Phantazmay couldn’t do anything since Redoer’s effect doesn’t target! In the End Phase Redoer returned to the field. Nadaban played Wyverbuster, banishing Dragondark, and Neven flipped The Phantom Knights’ Rank-Up-Magic Launch! He used it to turn Time Thief Redoer into Outer Entity Azathot! Nadaban had no plays due to Azathot’s effect, and gave the handshake! Rafael Neven is going to the Top 8 with Danger! Lunalights! YCS Chicago Top 8 Pairings and Decks! QQ: What’s Your Favorite Neo-Spacian?